Oh, What A Feeling, Malibu! - Cars! Cars! Cars! Oh, What A Feeling, Malibu! The first hands-on reports are hitting the internets and, well, it's honestly too early to say for sure, the Malibu looks to be a winner. As much as it hurts us to not poke fun at the Malibu, we feel inclinded to give a preliminary thumbs up to the folks at Chevy for trying to build the American car. Autoblog reports: First Drive: 2008 Chevrolet Malibu. Edmunds reports: Chevy Delivers on the Hype. 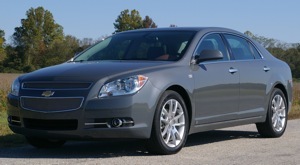 About: Cars reports: 2008 Chevrolet Malibu photo gallery. Car reviewer Aaron Gold claims there'll be a review linked in from these pages tomorrow. But he's from California, so you know what that means. Assuming the thing doesn't fall apart, we really feel Chevy has a home run on its hands. People want to buy an American car, from an American factory. And, we believe, that folks will take pride that it was union made. So, will the Malibu take off like a rocket and just keep going or will it take off and sputter out like the Saturn Aura has done? Also, which competing vehicle is most at risk here? We're thinking Ford Fusion. Then Korean makes. Then maybe the big Japanese three: Altima, Accord and Camry. What do you think?